Bubble lined mailers provide light-weight protection for your products. 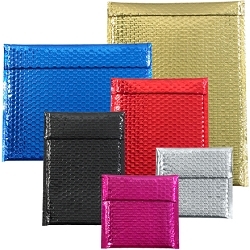 Try these stylish colorful glamour bubble mailers to add flair to your packaging. Mailers feature a 3/16'' high slip bubble lining for easy insertion of products. Peel and seal for easy packing.